Oklahoma! It just rolls off your tongue, doesn’t it? It’s probably my favorite state name, outside of Mississippi, of course. Oklahoma is hardly full of Amish. But, it does have a couple of settlements, including the 100-year-old community at Chouteau. Oklahoma’s two Amish communities are unlike most others, for one key reason. 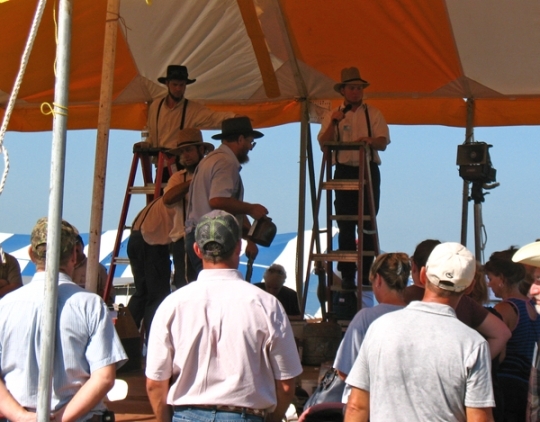 You can read more, and also see more photos of the annual Clarita Amish school auction, in the new State Guide entry on Oklahoma Amish. Good morning Erik. Have you ever been to the Mennonite settlements of Mexico, i have never been myself but i find it very interesting that any are even in that country. Their dress is very different from the old order Mennonites from the states, and I’m sure some even speak Spanish. Richard from the Amish settlement of Lebanon county. Thanks, Erik, for this informative article. My husband and I have passed through Chouteau many times on our trips between MO and TX, and I’ve seen the Amish Cheese Store. I just thought it was someone trying to cash in on the Amish name, and never stopped in. Next time I will stop and check it out! It’s fun to discover the Amish living in places you wouldn’t normally expect! I LIVE BETWEEN CHOUTEAU AND LOCUST GROVE, OKLAHOMA FOR OVER 20 YEARS, FIRST THE CORRECT SPELLING IS “CHOUTEAU” AND I HAVE BEEN IN THE AMISH CHEESE STORE MANY TIMES IT IS OWNED AND OPERATED BY THE AMISH., AND THEY HAVE A DELI ALSO, THAT IS VERY GOOD AND A BAKE SHOP THEY HAVE FRESH BREAD EVERYDAY. When I was younger I lived in Chouteau and I had Amish babysitters. At the time I didn’t think much about it except for the fact that I thought they were “lucky” to have so many “cool” things at their home. But as I reflect as an adult I realize that their extreme lifestyles keep them family based and faithful to God. There are many times that I stop and think “where did I learn how to do such and such” and then I think “oh, my Amish babysitters”. Example: If I were lost in the woods and dying and I saw a rabbit I would say, “I can skin that. I saw my [Amish friend] do that. Not that I want trade their lifestyle for mine completely (as I type this I have 3 tabs open, 1 blog , Facebook, and this page.) But I think it is important to observe and mimick many aspects of their culture because at the end of the day they can honestly say that they earned what they have and taught their children to do the same. To me there is real honor in that. Hi Richard, one of my workmates is from Durango and she’s been to the colony down there. She did say they spoke Spanish as well as PA Dutch and English. I’ll ask her for more details next time I run into her, but it seems like they don’t interact as much with the locals down there as say, the Amish do up here. Also, there are some groups of Mennonites in Belize as well. One of my Mennonite friends from high school would venture down with her family down there and deliver medical equipment to them. I love this piture for I have never seen auctioneers stand on step ladders to do their hollering. Hi! I am a resident of Oklahoma and would love more information about Oklahoma Amish, I am also a nurse and need information on Amish demographics across the nation, any ideas? Thanks for the information Lindsay i did a short post on my blog about those old colony Mennonites down in Mexico. I think ill be staying put in the states though, but i would like to hear from folks who have been down there and maybe share their stories about it.Oklahoma is going through a very tough time right now, and im sure the state is in a lot of our thoughts. Richard from The Amish settlement of Lebanon county. They get around, those Mexican Mennonites. I’ve read various reports about them going from South America to the farm lands of Southern Ontario. One episode of “Globe Trekker” stumbled across a community in Belize I believe it was, quite sparse, no drinking, partying or being a “jammy git” generally as one of the other, non-American, hosts might put it. I recall Ira whatever he was writing about Spanish-language Mennonites on his blog at one point. I haven’t visited his site in a long time. The Old Colony Mennonites living in Mexico as well as other Central and South American countries (and Canada)do not speak Pa. Dutch as the Amish do. Their dialect is called Platt Deitch. The Hutterites, the Amish, and Old Colony Mennonites have one thing in common and that is the High German language they use in their church services and for Bible reading. All three have a different dialect they speak in their everyday lifes at home. None can understand the other. I know, for I have been with all three many times. I speak Pa. Dutch but can not communiate with The Hutterites or the Old Colony Mennonites. We have to communiate in English. Helen Farrar; you might try sending Erik an email with your question about Amish demographics. Click on the About box in the header at the top of the blog, his e-address is towards the bottom of the page. He probably did not see your post, but I know he is always quoting this report or that report about Amish growth rates, retention in their church etc, so I know that information is out there. BTW: I’m interested in the Oklahoma Amish communities; too as we hope to be moving up north of Choteau in northern Mayes or southern Craig County if we can ever get our house sold. Glad the Oklahoma Amish (and Mexican OC Mennonites!) are getting their due here! Enjoying these responses–Oldkat Helen and I actually already were in touch over email but I do appreciate you pointing folks in the right direction. And quite cool you are considering an Amish Country Oklahoma move. I am hard at work on the “Montana Amish” entry as I write this (well, I’m on my break time actually, so I thought I’d check in on the comments 🙂 ) Hope to have it ready by tomorrow. Found some really great Montana pics, which the author has kindly allowed me to share. Also there is an Amish community between Tupelo and Wapanuka–I believe it is in Ponotoc County, but I do know it is only about 25 miles or so east of Ada Oklahoma. I hasve never been there but I do know they sell the regular baking stuff, fresh eggs and quilts. One day I was on the east side of Ada at a convenience store and a driver came in with maybe 5 men ( for gas). I have been to PA and my friend drove the Amish there so I got to meet quite a few of them including a schoolteacher, whose family operated a meat market on Sat. I was also privileged enough to visit a farm and hang out there for most of the day. Awesome. Anyway please search out this community and they don’t need to be forgotten. Thank you.